Abbie Conant portrays Aletheia through acting, singing, and trombone. The Illinois State University College of Fine Arts and School of Music invite you to a special performance of Aletheia from the talented artistic duo of Abbie Conant and William Osbourne at 8 p.m. Wednesday, April 18, in the Kemp Recital Hall. This recital is free and open to the public. 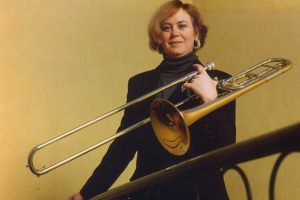 Award-winning performing artist and Juilliard-trained trombonist Abbie Conant. Portrayed by Conant, Aletheia is an opera singer who has been asked to perform for an opera gala. As she prepares herself, she starts to reconsider. She wonders why she is struggling to go down to the courtyard to impress the guests. Why won’t her feet move? Does she not know that she lives in a cage, a cage in the form of an iron maiden? The word Aletheia is one of several ancient Greek words for truth and roughly means “creating a space where truth can appear.” A multimedia performance, Aletheia is written for singer/instrumentalist, computer controlled piano, and quadraphonic electronics. An award-winning performing artist and Juilliard-trained trombonist, Conant’s story is one that chronicles an uphill struggle against sexism in the orchestral world. In a blind audition, she won the position for principal trombonist in the Munich Philharmonic Orchestra. When the orchestra learned that she was a woman, their attempt to deny her entry led to a 11-year court battle where, after standing victorious, she won a fully tenured professorship at the University of Music in Trossigen, Germany, and left the orchestra. William Osbourne orchestrates the ethereal and powerful sound of “Aletheia” through computer controlled piano, and quadraphonic electronics. Performing with Conant is her husband, William Osbourne. The grandson of cotton farmers, Osborne worked his way through college, then studied with avant-garde composer George Crumb for five years and Franco Donatoni for two years. 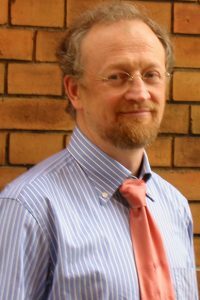 His work has led him to receive two ASCAP awards, a Doctoral Fellowship to Columbia University, and a major prize from the Theatre Commission of the City of Munich for his productions of Samuel Beckett’s work. Founding The Wasteland Company in 1984, Osbourne and Conant continue to explore women’s roles in music theater. They have produced five evening-length chamber operas for singing/acting trombonist. In recent years Conant and Osbourne have toured to over 165 cities. The Illinois State University performance of Aletheia is the conclusion of a 28-university tour throughout the United States that began fall of 2017. Additional information about Conant and Osbourne, and their work including Aletheia, can be found on their website. All images are used with permission of Conant and Osbourne. Performance parking is available for free in the School Street Parking Deck in spots 250 and above, 400 West Beaufort Street.